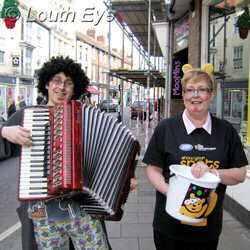 The people of Louth were enthusiastically raising money for Children in Need on Friday. 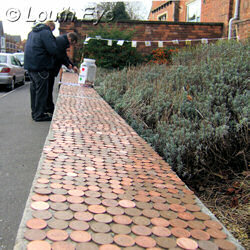 People collected spare change for Coppers on the Wall outside Sessions House, whilst others dressed up and did silly things in aid of the cause. George Gustard, Stuart Leafe, Rod Ayton and Gareth Laking planned to sacrifice their leg hairs at Kenwick Park Hotel in a fundraising leg wax. Ouch! The Official Louth Town Guide for 2011-12, produced by Louth Town Council, is printed and ready for distribution. It contains information about the council, councillor listings, public services, local amenities and more. This year's guide doesn't include listings of local clubs, however, because of the numbers of them and keeping so many of them up to date. 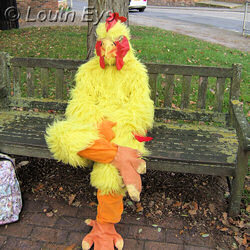 I can sympathise. It's hard to keep the club listings current on this website unless people get in touch about changes, so if you spot any errors please use the contact form. On the subject of clubs, there's a new Zumba group at the Mayfair Club, aka Smilie's, just off Wallis Road behind the Meridian Leisure Centre. It's run by Aleashia Desforges and Michelle Cooper and it replaces the zumba group that used to meet at the Hospital Club on Saturdays. Classes are Saturday mornings at 9.30 and 11am. This Tuesday at the Town Council planning authority met, and the solar panels for Meridian Leisure Centre and the Pavilion at London Road were up for the first stage of approval. The Town Council approved them. For Meridian Leisure Centre this will be 210 panels of 50kwp each, with 42 panels of 245kwp capacity for London Road. This is the hugely expensive solar panel scheme that's going to cost us all a wodge of cash which won't be repaid for at least a projected 9 and a half years, by which time the panels could be in poor nick anyway and due for replacement. On the 12th of December the Feed-In Tariff scheme will see drastic reductions in the subsidy for solar PV installations, down from as much as 43p per kilowatt hour to 21p for many homes. This will make it less economical for many people to consider having the panels put in, and it will surely have a drastic effect on the market for them. I don't doubt that demand for solar panels will drop in the short term, and this can only have a dampening effect on the price of such equipment. I don't know at what rate the Leisure Centre and London Road installations are eligible for the subsidy in any case due to their size, if they are eligible at all. This is a situation that's currently under government review, and the rates of tariffs could change yet again. However these installations will be affected by the price of the solar cells. If the price has been unduly inflated by FIT scheme then this is an economic bubble ELDC should wait to see burst before they go ahead and spend �498,000 of taxpayer cash on this scheme.